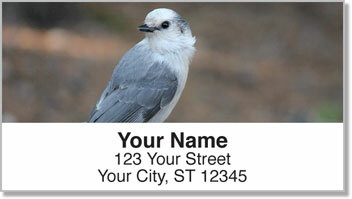 The gregarious Gray Jay is smart little bird who has figured out humans are a great way to get a free snack! 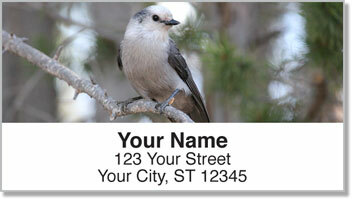 Instead of flying away from campers as most birds do, the Gray Jay often begs for something to eat. But watch out! If he doesn't get what he wants, he just might steal it! Unlike most songbirds, these guys can carry away food with their feet. 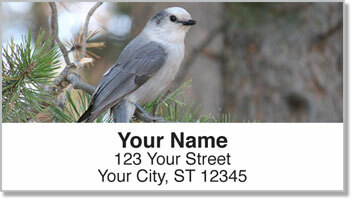 Gray Jay Bird Address Labels from CheckAdvantage feature four photographs of these mischievous feathered friends. It's a unique choice for nature lovers and birdwatchers! The convenient self-adhesive backing on our labels will save you a considerable amount of time. No more messy licking...just peel and stick on your outgoing mail! 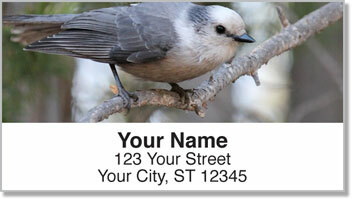 Get your own Gray Jay Bird Address Labels today!